How do you approach the controversy of Waite’s swapping the positions of Justice and Strength? For most Tarot reading purposes that makes no difference. As far as the delineation of the spiritual path is concerned it does. With the Hermit’s light and introspection we begin to analyze life and begin questioning things. Karma is a major spiritual law: cause and effect. The Hermit is looking at the arcanum Justice, to his right and questioning: has it been a fair game so far? If so, at a particular ripe time in the soul’s journey, we move forward and skip to Strength. If not; if we committed a transgression which generated an emotional burden between two or more souls then we enter the Wheel of Fortune and come back to pay, as well as receive, by allowing others to pay us, and restore balance by doing justice. Notice that the wheel sits on a stream of water: emotion. We cannot escape the Wheel of Fortune until debt is paid. The Hermit and Justice with their natural-law-abiding wisdom make sure of that. So the Hermit is always illuminating the past and present to see if it has been fair or not. First karma is paid and only then can we say a particular cycle has ended and a new one begun spiritually. Justice must, by natural law, come before the Wheel of Fortune and before the Hermit, not after. We don’t go to jail and then are found guilty or innocent afterwards. “Justice” on every level of duality, works the other way around. Karma means: cause and effect. That is a law. But karma or, cause and effect, does not relate only to transgressions that impinge on our and others’ free will, it also relates to accomplishment. The soul has a plan prior to incarnating. The measure of success is shown by the arcanum The Chariot. Have we done what we set out to do in this incarnation, or by a certain time frame in this incarnation? If yes, then a new cycle may begin. If not, then we may repeat the plan. And that is why Justice is right after the Chariot. 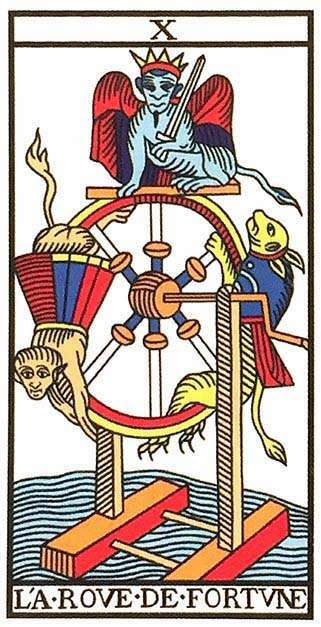 The sphinx figure holding the sword atop the Wheel of Fortune is Justice. It touches the wheel and has the power to stop the wheel from turning. The invisible hand of God which turns the crank abides gracefully showing that this drama is Impersonally moved in essence. The result of paying karma successfully is a forward movement in spiritual learning and development, rather than cycling back to try again and “do it right”. This type of cycle can be seen within one lifetime when we realize we want to make amends to those we harmed, or do something good to ourselves that we failed to do earlier in life; or it can apply to multiple lifetimes, when the harm was so great that we were not able to make amends and thus must reincarnate in order to do so. Paying karma successfully produces spiritual maturity, wisdom and psychic/spiritual Strength. Strength is the basis of conscious spiritual development on the physical plane, depicted by arcana XI through XXI. It is truly the beginning of a new and major cycle.